Are You Celebrating St. Patrick’s Day? Do you know the story behind this Irish holiday? St. Patrick was born in the 4th century, to parents who were the deacons of the Church. He was kidnapped as a teenager by Irish raiders and made a slave. He claims that he was visited by God in a dream, who told him to run away from captivity and head towards the coast, where he would find a ship that would take him back to Britain. He later joined the church and became a priest. Many years later he was called back to Ireland once he had become a Bishop, to convert the Irish people from their native beliefs of polytheism to Christianity. The shamrock has become a symbol of St. Patrick’s Day because St. Patrick used it to explain the Christian concept of the Holy Trinity to the people of Ireland. March 17 was the day that he died and was buried at Downpatrick. Since there are so many Irish descendents in the USA, St. Patrick’s Day is a much-celebrated holiday here. There are many celebrations all over the country featuring parades, displays of green shamrocks, large feasts, religious observances, copious amounts of alcohol, and lively parades. 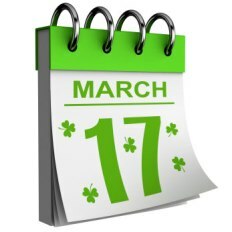 People who are participating in Lent are allowed to break their sacrifices for one day in order to celebrate St. Patrick’s Day, making this one of the leading days for alcohol consumption in the USA. The tradition is to wear green clothing on St. Patrick’s Day and those who are caught without an item of green clothing are pinched by their friends as punishment. Head to an Irish Pub for a drink and a bite to eat. You don’t have to go all the way to Ireland, as almost every city in America will have at least one Irish drinking establishment. Try a hearty glass of Guinness or a fine Irish whiskey to wash down a traditional meal of corned beef and cabbage or Irish stew. Don’t forget to wear green, unless you want to get pinched! Anything green will do, even a scarf or a hat. Go to a parade. There are hundreds of St. Patrick’s Day parades all around the USA, from Boston to New York to Chicago. The city of Savannah, Georgia even dyes its downtown fountains green during the celebration. Have fun celebrating St. Patrick’s Day this March and enjoy this ancient Irish tradition!